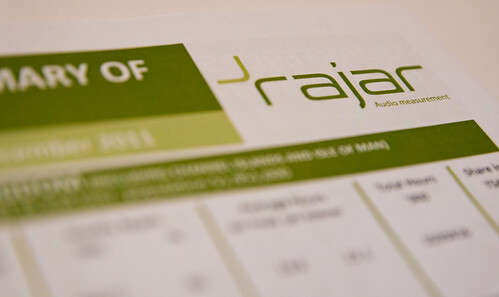 As the long nights begin to draw in, it’s time for RAJAR again. There has been a not insignificant amount of uncertainty as to what this quarter would bring, as it covers the Olympics and Paralympics (the Euros mostly fell in the previous quarter). The big question was what impact – if any – they might have on radio. We know that there were record TV audiences for the home games. BBC1 and BBC2 were up nearly 26% on the previous August, while overall viewing was up across July and August. If there’s one certainty with radio listening – it’s that if TV viewing goes up, radio tends to get hit. Radio listening did fall overall during the quarter. Although 89% of the population (47m) listened to the radio, the time they spent listening did fall 1.0% on the quarter. The average adult who listens to the radio listens for 21.9 hours a week or 3.1 hours a day. The share of listening between the BBC and commercial was essentially unchanged on the quarter, with the BBC having 54.2% and commercial radio having 43.3% (the remainder being made up of non-RAJAR measured services such as community radio as well some internet radio). In London, last quarter’s “aberration” that saw the BBC overtake commercial radio in London, was reversed, and we were back to commercial radio representing 51.3% of listening while the BBC has 45.3%. A disappointing quarter for Radio 2, with a 3.8% fall in reach and a 4.0% fall in hours. Since Radio 2 is the biggest station in the country, lots of other stations will be pleased about this! Not such a great result for Absolute Radio’s Network of services – and my employer. With a 7.3% fall in reach and 23.7% fall in hours. Year on year, the reach is up however. And I think it’d be fair to mention here, that Q2 2012 was the group’s highest ever figures. But with London in particular being hit, this remains a disappointment. Excellent results from 6 Music. The no-longer-threatened station is leading the BBC’s digital charge. It now has 1.6m listeners – an all time high – and 13.7m listening hours – another all time high. And also excellent results for Radio 4 Extra, which also saw record high reach and hours. Digital listening actually fell marginally this quarter – 31.3% from 31.5%. But in case any gloom and doom merchants latch onto – and they will – the overall trend is still very much up. In fact it was BBC digital listening that fell slightly this quarter. Commercial radio listening rose. In Chris Moyles’ final quarter, his listening actually fell a bit, down 2.8% on the previous quarter to 6.7m listeners a week. And Chris Evans on Radio 2 also fell a bit, by 4.5% on the previous quarter to 8.5m listeners. Dave and Lisa remain number one at breakfast in London (in commercial terms of course, since Radio 4’s Today programme is the actual number one). But elsewhere in London there are some significant double digit changes. We seem to be seeing more of these. In reach terms, Kiss is up 12.2%, Magic is up 11.4% and Smooth is up 11.9%, while Xfm is down 10.8% and BBC London is down 17.4%. But it’s in hours that there are real jumps. Capital, Gold and Kiss all see 20%+ increases in hours, while Magic is up a massive 50.1% and Smooth has over doubled its hours increasing 106%! On the other hand Absolute Radio London’s hours have fallen 55%, Xfm’s 17%, Heart 14% and Choice 10%. Indeed, of the major London stations, the only one that didn’t see a double digit change in listening was BBC London which fell 5.0% in hours on the quarter. It really does look as though we’re going to continue to experience “roller-coaster” figures in the capital. Magic has regained the number one position in London in terms of reach, and thanks to that massive increase in hours, it’s also number one on that measure. Furthermore, Bauer’s sister station, Kiss, is number 2 in London as measured in hours. In terms of groups, Bauer is up a little on the quarter in terms of hours, but down 4.3% on the year. Global has fallen a little on the quarter but is down 7.8% on the year. Real and Smooth Ltd is up nearly 10% on the quarter, and 2.5% on the year. Otherwise, most commercial groups have seen dips. So here’s that digital listening laid out since the measure began to be measured. I think what’s fair to say is that although digital listening has flatlined a little this quarter, the growth is continuing in the longer term, and that’s certainly true year on year. Within digital listening, there was a big boost for the internet last time around. Again, that’s fallen back a little this time around. Given the continued growth of smartphones, improvements in broadband, and growth of internet capable devices like tablets, it would be a rash man who didn’t honestly believe that this is likely to continue. Again, the growth is marked over the longer term. It shows that while digital listening to Radio 1 overall is quite low, it has one of the highest shares of online listening. On the other hand Five Live is the most digital of the BBC’s main networks. It’ll be worth keeping tabs on the internet portion of this chart in coming RAJAR surveys now that the BBC is rolling out its own mobile apps. I suspect that amongst younger listeners in particular, these will prove popular. Recently, Ipsos MediaCT hosted an event looking at radio research in particular. One of the really interesting stats highlighted at the event, was the amount of a station’s overall listening that listeners to the breakfast show represent. It’s a lot. Look at the chart below. What it says is that 72% of all Absolute Radio’s listening hours come from people who listen to the breakfast show. In other words, only 28% of the station’s listening hours come from people who don’t hear Christian. And if you look at some of the other big BBC breakfast shows, like Chris Moyles, Chris Evans and even the Today Programme, they all account for even more station listening. A big breakfast show really is important. OK – we all knew that anyway. But then look at Capital. They’re a Dave and Lisa aren’t quite as important to the overall station performance as some of the others. Perhaps that’s because Capital’s more about the music proposition that the personalities? That’s clearly the case for London’s new number one station. Whisper it if you know Neil Fox, but clearly Magic’s hours come more from people who don’t listen to breakfast than those who do. In other words, the station is clearly built around it’s music rather than presenters. Anyway, something a bit different. Finally, of course I couldn’t fail to update my regular RAJAR interactive chart. But click here to view it properly. And be sure to read the notes underneath the full sized chart. They highlight the strengths and weaknesses of it, and explain in a little more detail how to use it. Full RAJAR results are available on their website, and try their app on your mobile device. Absolute Radio’s press release can be found here. MediaUK will have quickly updated data with lots of charts, and James Cridland has some thoughts. Radio Today will have lots of the key RAJAR stories. Matt Deegan’s take including a worthwhile analysis of 6 Music v Xfm. Paul Easton has his regular analysis. Media Guardian has a couple of RAJAR stories from John Plunkett. Source: RAJAR/Ipsos-MORI/RSMB, period ending 16 September 2012, Adults 15+. Disclaimer: These are my own views, although they’re based on work I’ve done for Absolute Radio, and through whom I get access to the data. I also sit on the RAJAR Technical Management Group representing commercial radio. Just so you know.